It never occurred to me that using the word “team” could hold such significance until I was talking to one of my good friends about work. She stopped me and said “I like it how, whenever you talk about work, and you call your co-workers your team.” I smiled to myself because it’s times like this that make me realize what a unique place iVEDiX is. Our personal relationships and ability to collaborate directly relate to the quality of our work. So, I never thought to call them anything but my team. As most of us have experienced first hand, teamwork does not always come easy. This is why the entire company at iVEDiX takes an active role in creating opportunities to build relationships and work together on projects we’re passionate about. Whether it’s one of our “Thank you Thursdays”, a birthday party, community involvement, or patronizing a local pub or restaurant we make personal connections a priority. 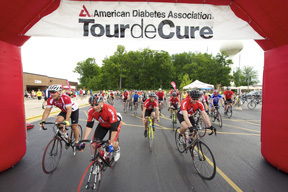 Next month, our team will come together in support of the American Diabetes Association Tour de Cure. Along with our neighbor Simply Crepes, we have formed a team with local businesses, individuals, and Vedics to bike for this worthy cause. By partnering with Simply Crepes we are able to offer all of our riders a $5 per person registration fee when they join our team. And as part of the iVEDiX community, we’d like to extend this offer to you! Promo code FLASH will take $20 OFF when you register with our team. This year marks my second annual Tour de Cure, my first ride was to honor a dear friend who has been living with diabetes since childhood. This year, I continue to ride for her in addition to family who have been recently effected by the disease. I hope that my ride will signify my support for their journey, perseverance, and victory as well as the promise of hope when we all come together for a great cause. I hope you’ll be a part of it, and thanks for being a part of our community!